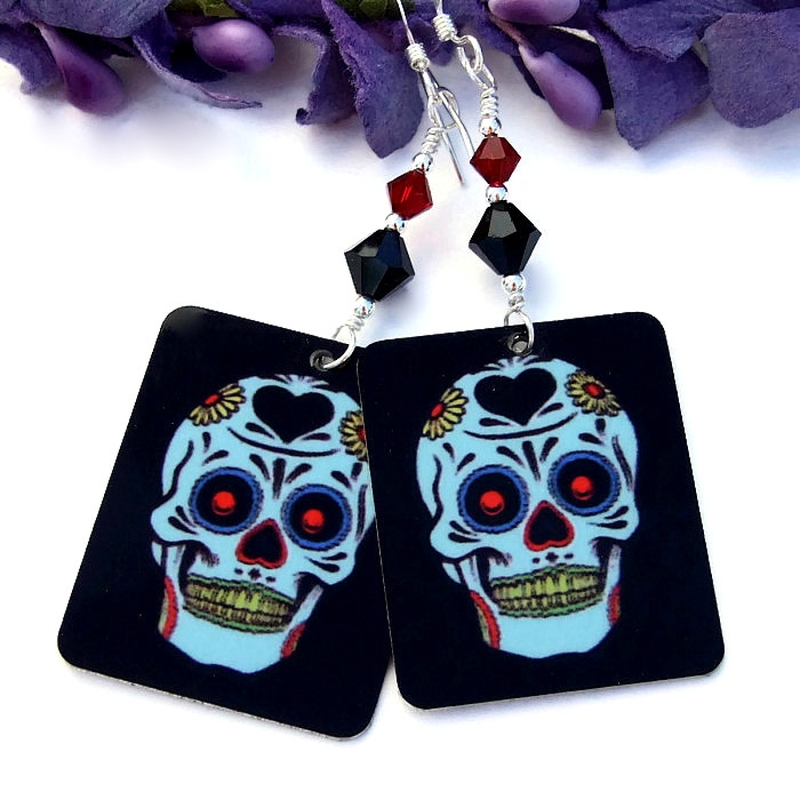 Ghoulish and fun at the same time, the SUGAR SKULLS handmade earrings are perfect for those Halloween and Day of the Dead festivities. 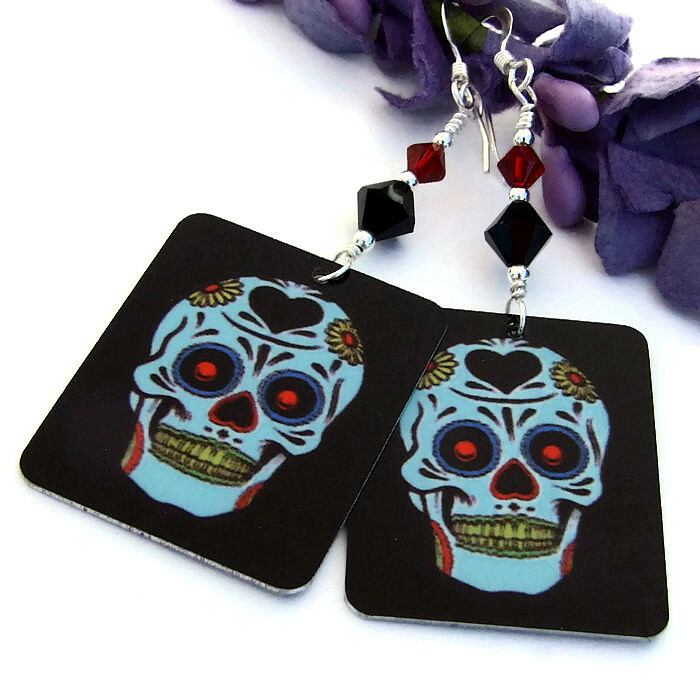 Created with a colorful design that was permanently transferred to lightweight, aluminum rectangles, the sugar skulls are highlighted against a black background and are decorated with traditional hearts and flowers. The back side of the rectangles are a shiny silver color. 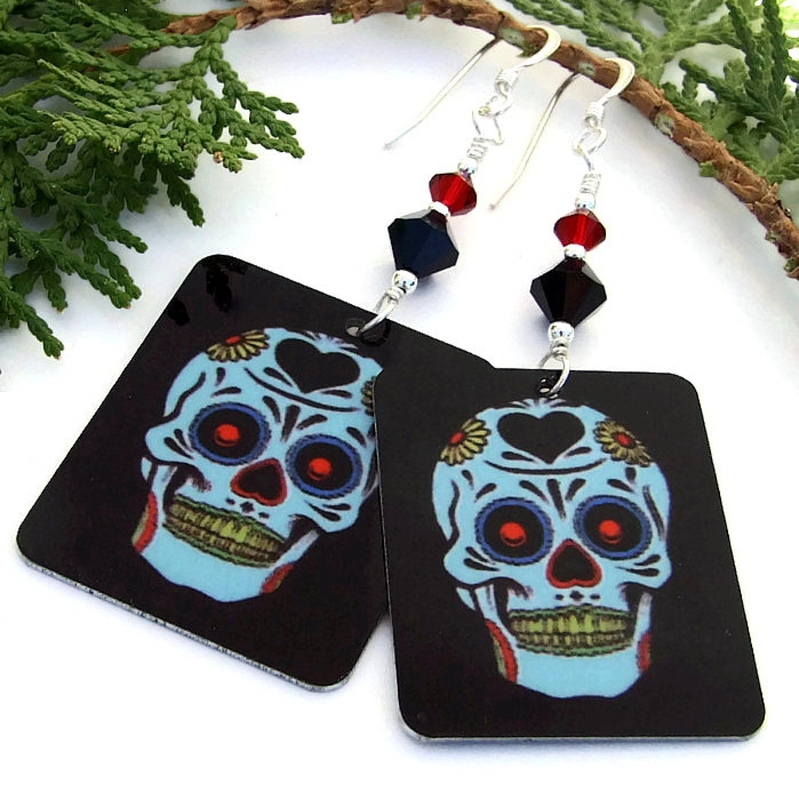 To add sparkle to the grinning skull earrings, larger jet black and smaller Siam red faceted Swarovski crystal bicones were carefully stacked and wire wrapped on sterling wire to the rectangles. 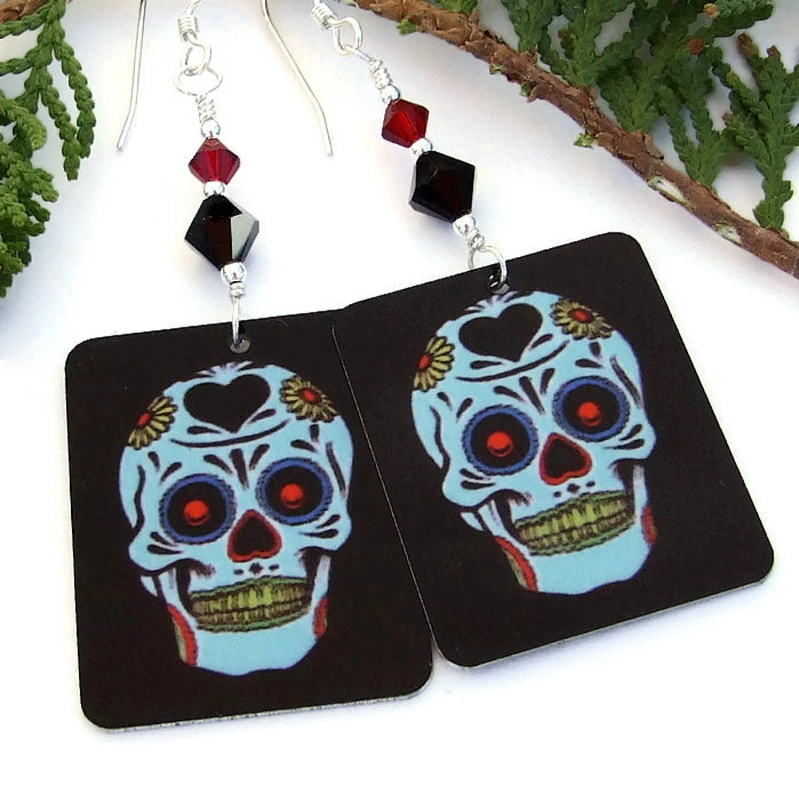 Definite eye catchers, the SUGAR SKULLS earrings were carefully designed and handmade by Catherine of Shadow Dog designs for the woman who loves to wear unique artisan jewelry. 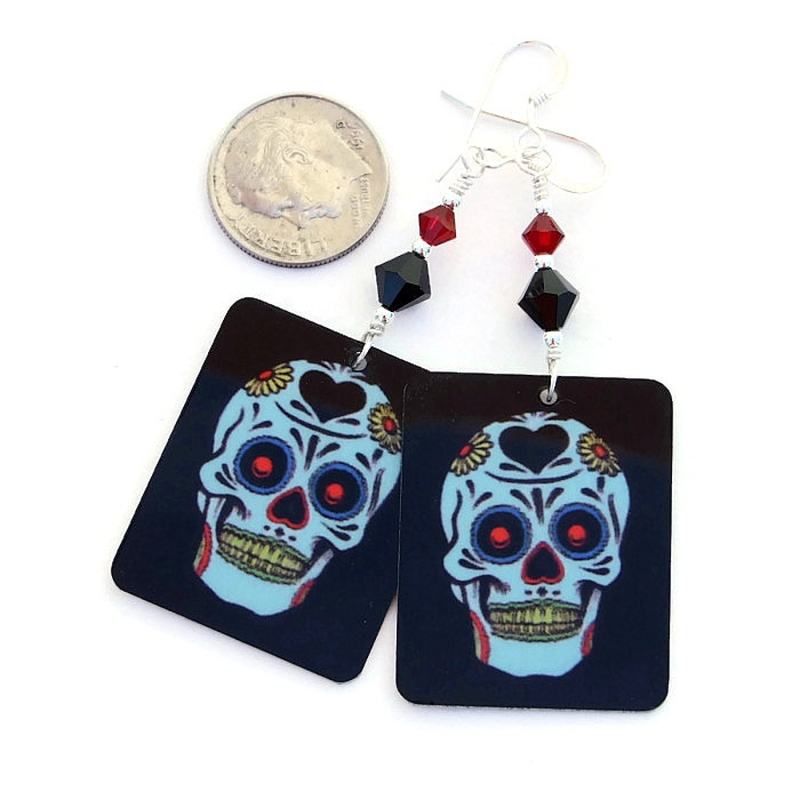 For a better understanding of the relative size of the SUGAR SKULLS Day of the Dead handmade earrings, please be sure to check out photo #5 for a size comparison with a dime. Skulls are believed to ward off evil and ensure protection and well being. Aluminum is worn for protection against negative energy. Even though man made, crystals are said to carry the energies of transformation, rebirth and communication. Silver is a metal of love and healing; it is a mirror to the soul, helping us to see ourselves as others see us. 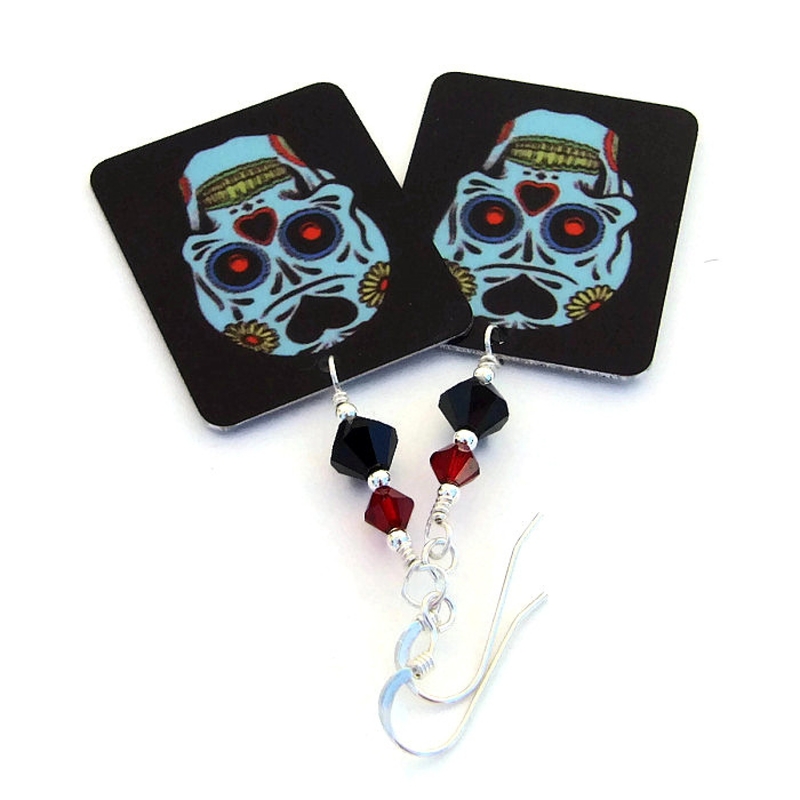 The SUGAR SKULLS handmade earrings were carefully designed and handmade in a dog friendly, smoke free studio. They will be carefully packed in an organza jewelry bag with tissue, perfect for gift giving to a loved one . . . or to yourself!